This 35 – plus member choir sings at the Sunday 10:00 AM Sunday Mass and special liturgies. The group focuses on a wide array of musical styles – from Palestrina to contemporary compositions. The choir rehearses on Tuesday nights from 7:30 – 9:00 PM. All are welcome. Contact Grant Sevdayan, Choir Director for more information at choir@svdphb.org. This choir sings at the Sunday 8:30am Liturgy. They use the best of recent music written for the Catholic Church, including composers such as David Haas and Marty Haugen. The instrumentation includes guitar, keyboard, flute, trumpet, and vocals. Rehearsals are 7:30 – 9:00 PM on Thursdays. For information contact choir members after Mass. This choir sings at the Sunday 5:00 PM Life Teen Mass. The group focuses on providing a prayerful atmosphere using the most up to date contemporary Christian music. The instrumentation includes guitars, percussion, piano, bass guitar, and vocals. Placement auditions are required. For information contact choir members after Mass. Saint Vincent De Paul Children’s Choir is open to children in the second grade and older. Children who participate in the choir, learn proper voice training, the correct technique for good breath support, and music literacy and appreciation, all while learning primarily a Catholic sacred music repertoire and more. Children sing at the 11:30 am Mass every 1st and 3rd Sunday year round and at the 6:30 pm Mass on the 2nd Saturday, except July and August. The choir also participates in Christmas and Easter Concerts, and the annual Festival. Practices are held every Sunday morning from 10:00-11:30 am (except for July). Twice a month there are additional practices on Saturday afternoons, 3 to 5 pm. Contact Victoria Sevdayan, Children’s Choir Director, at vicsevdayan@socal.rr.com for more information. Each CD sells for $10. 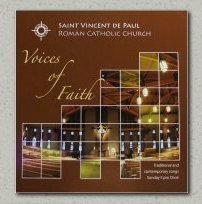 They make great gifts.These CDs are available in the Parish Office.Give a gift that both supports the church and lasts all year.